For any style of social dining such as banquets, award ceremonies, weddings and family celebrations a round table is the perfect choice. Made with a very strong metal frame and a sturdy wooden top, the tables are collapsible and fold down to lie flat or can be lent against a wall when extra space is required for dancing. 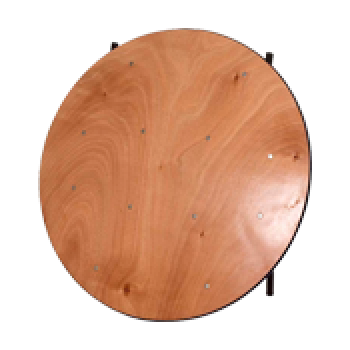 The round table is also an ideal choice for creative thinking workshops as it encourages face to face interaction. Whatever size party, we have a table for any occasion as our round tables comes in 3ft, 4ft, 5ft, 5’6” and 6ft and can seat from 2 to 12 people. For elegance, add our luxurious crisp table linen for a sophisticated look.